Here is my take on the most recent Tag You’re It Challenge (#28) . 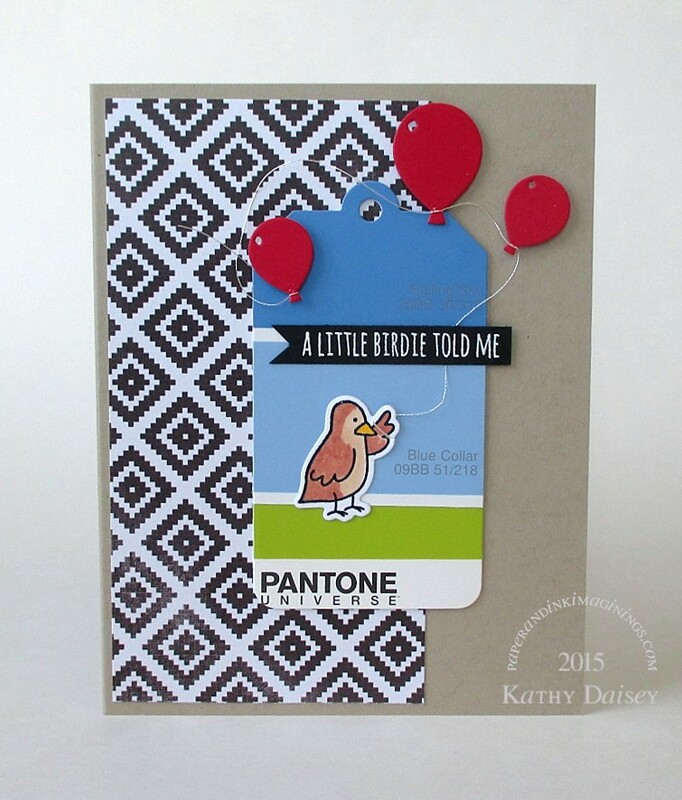 I used my new Essentials by Ellen Wish Big stamp set, and the sentiment “A little birdie told me” leaves it open for interpretation – birthday card? congratulations card? I can decide later. I die cut two different paint chips with the tag die, and layered them to be sky/grass. I used one thread for all of the balloons, rather than having individual strings for the bird to hold. Supplies: Stamps – Essentials by Ellen, paper – Glidden paint chip (blue), Heidi Swapp Favorite Things, Pantone paint chip Tender Shoots, Stampin’ Up! Basic Black, Crumb Cake, Real Red, inks – Papertrey Ink Fresh Snow, VersaFine Onxy Black, dies – Essentials by Ellen (bird), Lawn Fawn (tag), Taylored Expressions (balloons), embossing powder – Filigree Fine Art Powder clear, white, Coats metallic silver thread. 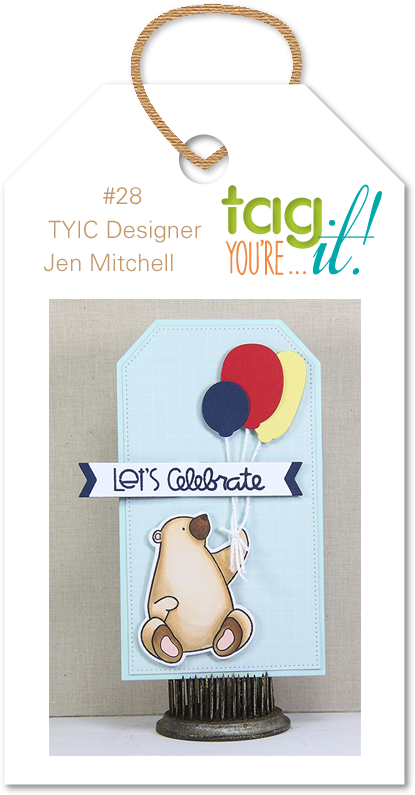 Categories: birthday, card, congratulations | Tags: card, Coats, Essentials by Ellen, Heidi Swapp, Lawn Fawn, paint chip, Papertrey Ink, Stampin' Up!, Tag You're It! Challenge, Taylored Expressions | Permalink. Clever use of paint chips. I love the little bird. Thanks for joining us at Tag You’re It! Challenge. Thanks so much, Kelly! I enjoy playing along with the Tag You’re It! Challenges! Yayyy for the paint chips! I have a bunch sitting on my shelf, awaiting attention, so thank you for the reminder! Your little bird: too cute! Leaving the sentiment open: great idea! Thank you for sharing this gem in the Tag You’re It gallery! Never thought of using the paint chips in this manner! Great idea! Thanks for joining us at Tag You’re It. This is so cute!! I love how the balloons are hooked to each other on that one string. So FUN. Thanks so much, Nora! The balloons got looped together on one string because I didn’t want to be fighting with 3 strings while assembling (and the bird’s wing gets overwhelmed with multiple strings). Thanks so much for commenting! Wow this is awesome love the way you did the balloons. Glad you joined us over at Tag You’re it.